Cement is essentially a finely powdered mixture of calcium silicate and aluminates along with small quantities of gypsum which sets into a hard stone like mass when treated with water. Cement is obtained by combining a material rich in lime, CaO with other materials such as clay, which contains silica, SiO2 along with oxides of aluminium, iron and magnesium. For a good quality cement, the ratio of alumina to silica should lie between 2.5 to 4 while that of lime to that of silica ,alumina and ferric oxide should be as close to 2 as possible. Raw materials required for the manufacture of cement are 1) limestone (CaCO3) , 2) clay which provides both silica and Alumina 3) gypsum. Small amount of magnesia and iron oxide are also required for imparting suitable colour to cement. The wet process is preferred when the raw materials i.e. limestone and clay are soft, climate is humid and fuel is cheap. The dry process is preferred when the raw materials are hard. The main raw materials are limestone and clay. Wet process supplies lime while the dry process is a source of silica , alumina and iron oxides. (1) The raw materials are first crushed separately in a suitable machine. They are then mixed in the required proportion( 3 parts limestone + 1 part clay) and grounded together finely.This grinding is done either by the dry process or by the wet process. (2) In the wet process ,the clay is washed with water in a wash mill to remove flint and other foreign substances. It is then mixed with requisite quantity of limestone and pulverised in a special mill.The resulting pasty mass is then throughly homogenised to get raw slurry containing about 40% water. (3) In the dry process, the raw materials are dried and mixed in desired proportion. The mixture is then finely powdered and passed through 300 mesh sieves and homogenised with the help of compressed air. The homogeneous mass is called raw meal. (4) The slurry or raw meal is introduced into the upper end of a rotary kiln by means of screw conveyer. The kiln consist of an inclined steel rotating cylinder, 150-200 ft long and about 10 ft diameter lined inside with fire bricks. 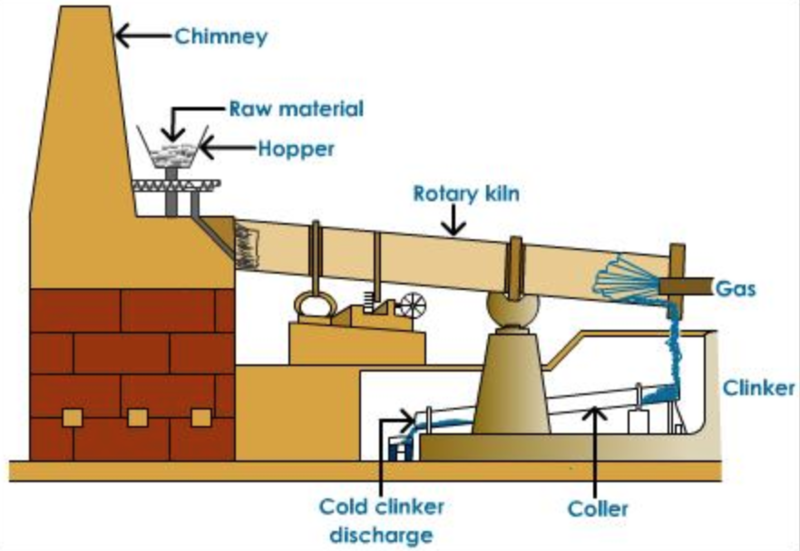 The charge travel downwards slowly due to the rotatory motion given to the kiln and is heated by burning coal dust which is blown in front from the lower end. The charge takes about 2-3 hours to cover the entire journey in the kiln. (1) In the upper part of the kiln, the temperature is around 1000-1100K .Here the charge loses all its water due to evaporation by hot gases. (2) In the middle of the kiln, temperature is around 1100-1200 K. Here limestone decomposes to form calcium oxide and carbon dioxide. (3) The lower part of the kiln, from where coal dust is blown in is the hottest with the temperature ranging between 1770-1870 K. As the charge reaches here ,chemical combination takes place between lime, alumina and silica to form calcium silicate and aluminates. Due to very high temperature in this zone, about 20-30 % combines with solid mass to form grey coloured balls called cements clinkers. The hot clinkers are cooled by cold air and are mixed with 2-3 % gypsum and finely powdered to 325 mesh size in grinding machine. The fine powder called the Portland cement is sieved and packed in bags. The important constituents present in Portland cement are dicalcium silicate ( Ca2SiO4) , tricalcium silicate ( Ca3SiO5) and tricalcium aluminate ( Ca3Al2O6). When water is added to cement, an exothermic reaction occurs. During this process , cement reacts with water to form a gelatinous mass which slowly sets into a hard mass having three dimensional network structure involving -Si-O-Si- and -Si-O-Al chains. Tricalcium silicate sets quickly and develops considerable strength within a few days. Dicalcium silicate sets slowly and develops appreciable strength after a month or so. Tricalcium aluminate sets instantaneously in presence of water. The internal strength acquired by cement is primarily due to the setting of tricalcium aluminate.